Background: Ethiopia is the second most populous country in Africa with a population of 90.1 million. The country achieved many MDG targets for health through institutionalization of Ethiopia’s innovative flagship Health Extension Program (HEP). The following statistics reflect the national situation in Ethiopia: Access to health services is >92%; under-five mortality and neonatal mortality are 64 and 28 per 1000 live births respectively; ANC1 coverage 98.1%; skill birth attendance 41%; and PNC coverage 66%. To accelerate reduction in newborn mortality and contribute to the post-MDG goals, a nine-pronged community based newborn care package (CBNC) was launched in March 2013 using the four C’s approach – contact, capture, care and completion. Methodology: A review of CBNC program was conducted from March 2013 to December 2014 to assess the status of implementation. Data reviewed included results of rapid assessment, routine program data, program reports and information from the quarter performance reviews. Results: CBNC package was scaled up including sepsis management. Primary Health Care Unit capacity was strengthened to provide quality maternal, newborn and child health in catchment health posts. Skilled delivery, postnatal care and follow-up have significantly improved in the 7 zones. Contributing factors for increased uptake are: increased care seeking through community mobilization/sensitization using the Health Development Army; policy change for hospital stay for 24 hours post-partum; allowing birth companion and cultural ceremonies at health facilities; emergency transport/referral systems; maternity waiting homes; BeMONC, CeMONC and helping babies’ breath (HBB) strategy expansion; and cost exemption of maternal and newborn health services. Barriers identified include: cultural belief and practice, late identification of pregnancy and lack of awareness of newborn care practices. Conclusion: Continued improvement of the implementation of the CBNC package using the identified facilitators of intervention uptake and addressing barriers will contribute significantly Ethiopia achieving its goal of reducing newborn mortality and morbidity. Background: Sri Lanka has demonstrated remarkable progress in its health indicators with a relatively modest investment in health. The maternal mortality ratio is around 30 per 100,000 live births and antenatal care coverage is almost universal with 99.9% institutional deliveries in which more than 95% are at facilities where comprehensive emergency obstetric and neonatal care services are available. Methodology: A comprehensive desk review of documents on postnatal care (PNC) was carried out with the objective of identifying approaches used for PNC and achievements of facility based PNC. Results: The facility based maternity care services were introduced in the 1870’s and registration for practicing midwives was made policy. In 1926, trained midwives were appointed to the field with the objective of providing skilled maternity care at home. With the expansion of the hospital network, home deliveries declined and by the 1990’s more than 90% of deliveries were institutional. The policy of keeping women in hospital for at least a day after a delivery was practiced from the inception. The delivery care is provided by a trained midwife. Immediate essential newborn care, including delayed cord clamping, thermal care, skin to skin care, eye care, initiation of breastfeeding and immediate postpartum care, take place in the labour room where both are observed every 15 minutes for 2 hours. At postnatal ward they were observed every 4 hours for 24 hours. BCG immunization, birth registration, establishment of breast feeding, counselling on family planning and emergency preparedness, newborn and maternal examination are carried out before discharge. The referral pathway has been established to care for the most vulnerable. Conclusion: Although Sri Lanka has achieved universal coverage of facility based PNC, more opportunities are available to improve the quality of care to reach effective coverage. Postnatal Home Visits: Effective in Field Trials, What About in the Real World? Background: There is growing realization that implementation research in realistic field settings is at least as important as the rigorous randomized controlled trials studies that guide the content of interventions. New service delivery strategies must be tested under real-world conditions before being taken to scale. WHO and UNICEF issued a joint statement in 2009 urging ministries of health to implement programs that use community health workers to conduct postnatal home visits (PN HVs) in order to reduce newborn mortality. While the literature contains evidence that newborn mortality can be reduced when PN HVs are delivered in carefully controlled field trials, little is known regarding how these programs perform when implemented at scale through regular government services. A team from Save the Children (SC), WHO, UNICEF, USAID, and the Maternal Child Survival Program (“Team”) is conducting a global review (“Review”) of country-level experience with the implementation of PN HVs at scale. Methodology: The Team assessed ten countries during Phase One of the Review for their potential to provide rich learning opportunities. The Team selected Bangladesh, India, Malawi, Ethiopia, Nepal and Rwanda for more comprehensive review during Phase Two. The Team reviewed existing data and reports, conducted interviews with key informants, and collected primary quantitative data through small-scale surveys in order to develop findings and conclusions across focus countries. Results: The Review is currently in process (as of April 2015). Specific findings to be presented at the conference will include what has been learned from successful and unsatisfactory experiences implementing PN HVs at scale; which components of programming have performed well and which require further strengthening; and, which factors drive positive performance or constrain its achievement. Conclusions: The review will highlight the key requirements for effective delivery of PN HVs at high levels of coverage at scale through government health services. Background: Each year an estimated 289,000 women die worldwide from complications related to pregnancy, childbirth or the postnatal period and up to two thirds of such maternal deaths occur after delivery. There are also 2.9 million neonatal deaths per year. 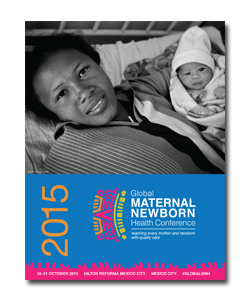 Of the maternal and neonatal deaths that occur globally, 99% occur in low- and middle-income countries (LMICs). Compared with other maternal and infant health services, coverage for postnatal care (PNC) tends to be relatively poor. In Kenya, for instance, fewer than 20% of women use PNC services, while this proportion is 35% in the Democratic Republic of the Congo. Methodology: We conducted a systematic review of peer-reviewed and grey literature to assess the socioeconomic, geographic and demographic inequities in the use of postnatal care services in 31 low- and middle-income countries. We summarized the relevant studies qualitatively and performed meta-analyses of the use of PNC services according to selected indicators of socioeconomic status and residence. Results: Our results showed a gradient in the use of PNC services according to quintiles of socioeconomic status (SES); for instance, compared with women in the lowest SES quintile, the pooled odds ratio for use of PNC by women in the fifth quintile was: 2.27 (95% CI: 1.75–2.93). In addition, meta-analysis showed that compared to women living in rural settings, those living in urban settings were more likely to use PNC services (pooled OR 1.36). A qualitative assessment of the relevant data also indicated that use of PNC services increased with the level of education. Conclusions: PNC services utilization remains highly inequitable and varies markedly with SES and between urban and rural residents in LMICs. These findings speak to the need for both community-level interventions to promote the use of PNC services, and health systems interventions to improve the supply of affordable and quality PNC services. Background: Most maternal and infant deaths occur in the days and weeks following childbirth, yet, this is the most neglected period for the provision of quality care. In 2013 WHO updated guidelines that addressed the timing and content of postnatal care (PNC) and contacts for the mother and newborn following normal childbirth in resource-limited settings. In addition WHO and UNICEF issued a joint statement in 2009 on Home visits for the newborn: a strategy to improve survival. It includes evidence-based information on how trained community health workers can be effective in reaching pregnant and lactating women and newborns. These recommendations have been corroborated through systematic reviews published by WHO in 2012. 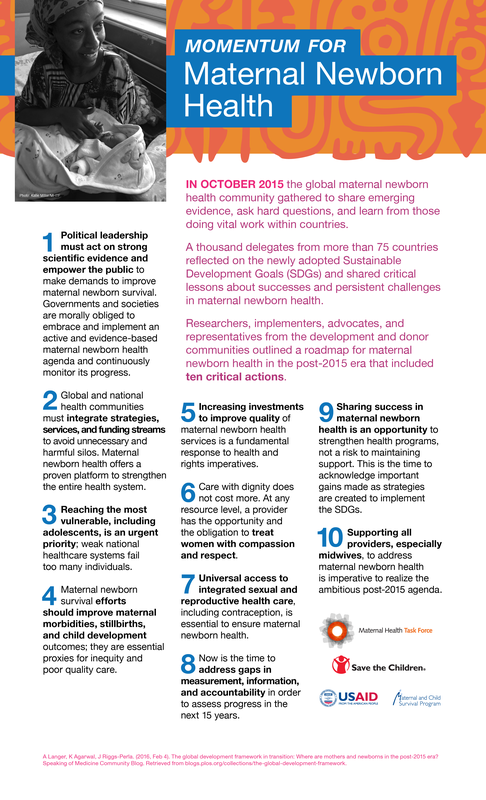 The publication Optimizing health worker roles to improve access to key maternal and newborn health interventions through task shifting aims to address critical health workforce shortages that slow down progress towards the Millennium Development Goals. Methodology: WHO recommendations are based on a systematic process of evidence review using an expert consultation, that considered the quality of the evidence using GRADE criteria, benefits and harms, values and preferences of policy makers, health care providers and parents, and whether costs are justifiable relative to benefits in low and middle income countries. Results: The PNC guidelines include twelve recommendations covering the following areas: timing of health facility discharge; number and timing of PNC contacts; PNC home visits; assessment of baby; exclusive breastfeeding; cord care; other postnatal care for baby; assessment of mother; counselling; iron and folate supplementation; prophylactic antibiotics; and psychosocial support. The joint statement from WHO and UNICEF provides complementary guidance on health cadres to implement the recommendations. Conclusions: To improve the coverage and quality of PNC it is critical that service providers, policy-makers and program managers are knowledgeable of the recent evidence-based guidelines and service options using their available health work force. Background: La fistule obstétricale iatrogène est un accident qui survient pendant l’accouchement, lorsque le prestataire pose un acte obstétrical. Sa prévalence, dans le monde, varie de 6% à 24%. Le manque d’équipement, la faible formation clinique des prestataires favorisent la survenue de la fistule iatrogène. En milieu rural, les femmes se présentent en retardau centre santé. Certains gestes obstétricaux pratiqués en urgence durant le travail, pour sauver les femmes, favorisent la survenue des fistules obstétricales iatrogènes. Cette étude a pour objectif de décrire l’environnement clinique dans lequel la fistule iatrogène survient et d’établir la relation entre les lésions anatomiques observées et l’acte obstétricale associé. Methodology: Nous avons mené une étude descriptive, rétrospective exhaustive des types anatomiques des fistules obstétricales et l’acte obstétrical associé, chez 47 femmes parmi 566 opérées de fistules obstétricales à l’Hôpital Saint Joseph de janvier 2011 au 31 mars 2015. Conclusion: Notre étude a montré la prévalence des fistules iatrogènes à 8,3%, ce taux se rapproche à celui d’autres auteurs. Le travail prolonge augmente le risque des gestes obstétricaux d’urgence qui peuvent causer la fistule iatrogène qui est un indicateur de la qualité des soins offerts aux femmes pendant l’accouchement. L’implication des familles, de la communauté, l’accessibilité géographique, le renforcement des capacités institutionnelles, la formation des prestataires sont importants pour offrir des soins de qualité aux femmes. Background: A twofold increase in exclusive breastfeeding was documented from 2008/09 (32%) to 2014 (61%), at the national level in Kenya. Creative and innovative approaches to communicate nutrition messages to women at the community level can strengthen immediate and exclusive breastfeeding practices. Community Support Groups (CSGs), comprised of mothers and other key influencers, were part of the United States Agency for International Development (USAID) funded Maternal and Child Health Integrated Program (MCHIP) in Igembe North, Kenya. CSG gatherings offer an opportunity to socialize, exchange ideas, and to learn healthy infant and young child nutrition (IYCN) behaviors through the Baby Friendly Community Initiative (BFCI). A CSG Assessment was conducted to ascertain the effectiveness of the community support groups on IYCN knowledge, attitudes and practices (KAP) among attenders and non-attenders of support groups. Methodology: KAP interviews were conducted with mothers of children 0-23 months of age attending the CSGs (N= 53) and non-attenders of CSGs (N= 50) in Igembe North. Through purposeful selection, 15 of the 25 CSGs participated in the assessment. Results: Mothers who attended CSGs were more likely to attend more than three ANC visits (63% vs 38%) and to deliver in health facilities (86% vs. 51%), than non-attenders. Mothers who were actively involved in support groups had improvements in knowledge of both initiation of breastfeeding within the first one hour of birth, and non-use of prelacteal feeds. Attenders noted being better equipped to resolve any breastfeeding problems in comparison with non-attenders. Most non-attenders had shorter duration of exclusive breastfeeding and tended to introduce complementary foods early, prior to 6 months of age. Conclusions: Community support groups offer a platform for mothers and influencers of IYCN to strengthen and further improve immediate and exclusive breastfeeding practices. Background: Maternal perceptions of insufficient breastmilk is a major barrier to immediate and exclusive breastfeeding, yet limited evidence and guidance exists on how to address this issue in newborn health programming. The United States Agency for International Development (USAID)-funded Maternal and Child Health Integrated Program (MCHIP) implemented Smart Project, with a focus on improving newborn health and the nutritional status of children less than two years of age. A doubling in stunting prevalence in Lower Egypt between 2005 and 2008 prompted a research study, as part of the MCHIP program, to examine infant and young child feeding practices within the context of stunting in children less than 2 years of age. Commonly held perceptions, beliefs and practices which hinder immediate and exclusive breastfeeding were examined in order to generate guidance for strengthening newborn health programming in this area. Methods: Implementation research was conducted in Upper and Lower Egypt in February-April 2013 among women who participated in the MCHIP/Smart project. Qualitative data collection consisted of in-depth interviews with 150 women, with children 0-23 months of age. Mothers discussed perceptions and cultural norms surrounding breastfeeding practices and problems experienced during breastfeeding, as well as early introduction of certain foods and liquids. Results: In the first few days of life, most mothers provide herbal drinks to sooth children’s crying. Following these prelacteal feeds, most mothers continue to provide herbal drinks and introduce foods in the initial months of life, as a response to perceptions that breastmilk is lacking in quality and/or quantity. Provider advice regarding how mothers can address insufficient breastmilk was inadequate and encouraged mixed feeding, which was supported by some grandmothers and fathers. Conclusions: Community-based strategies and messages to dispel misperceptions regarding breastmilk insufficiency by mothers, health workers and family members can strengthen immediate and exclusive breastfeeding in newborn health programs. Demand or Supply: What is the Limiting Factor to the Success of Iron-Folic Acid Supplementation? Background: Anemia prevalence has not changed in many regions over the last several decades. In Indonesia, the national prevalence of anemia among pregnant women declined from 50.9% in 1995 to 37.1% in 2013. The proportion of women taking any IFA supplements increased from 67.1% in 1994 to 89.1% in 2013. However, only one-third of women (33%) took 90+ IFAS in 2013. This presentation reviews how Indonesia increased coverage of women taking any IFAS and the remaining challenges for reducing the prevalence of anemia. Methodology: We reviewed literature on Indonesia’s past and current strategies to reduce maternal anemia and identified programmatic barriers to reducing anemia. Results: Sufficient supplies, equitable distribution, and high demand from the user are three essential components for successful IFAS programs. While national supplies of IFAS in Indonesia are good, IFAS are not available at all service points. Demand creation through effective communication has not been scaled-up. Studies in Indonesia show that women are concerned about IFAS causing too much blood and a big baby which is believed to cause obstetric complications. Women are concerned about unpleasant side effects which they are not told how to manage. The MotherCare project 1990-1999 increased the coverage and compliance of IFAS after increasing distribution points through traditional birth attendants and the marriage registration program combined with a communications campaign to increase demand and adherence. In addition, two national pharmaceutical companies produced IFAS and distributed it through private sector vendors which increased the IFAS availability. Conclusions: IFAS are effective in reducing anemia when access is accompanied by demand creation and strategies that improve adherence to accelerate the reduction of anemia, Indonesia needs to redouble its efforts to ensure that adequate supplies are widely available and that counseling strategies address behavioral obstacles to achieve strong adherence to IFAS, as recommended in pregnancy. Background: There is increasing interest amongst female genital fistula stakeholders to understand outcomes of fistula repair surgery as well as the contribution of iatrogenic causes. Methodology: This was a prospective study on more than three hundred patients registered between June 2011 and June 2014 at Hopital National de Lamorde and the Central National Referral Center for fistula in Niger. Outcomes assessment was based on an unpublished classification system (to be described in this presentation) using four criteria (fistula environment, size, illustration and prognosis). Results: More than three hundred women underwent fistula repair; 94. 4% through vaginal route. Six types of fistula were described under this classification system, with Iatrogenic Fistula falling under the label ‘Type VI’ and contributing to 5.4% of the fistula. A small proportion of the women (7.7%) were lost to follow-up at three months, but most had successful closure as well as continence. The 6.7% closing failure rate was frequent in types III and V. Post-surgery urinary incontinence was found in 21.30% (more common in types II, III, IV and V). Conclusion: Iatrogenic fistula is not yet recorded as frequently as in some regions, such as Southern Asia, but is becoming an issue with significant concerns for treatment and prevention. Some aspects make it stand out as a type of fistula different from the other categories.